" In this easy-read chapter book, Andy Shane and Dolores Starbuckle both select Egypt as their project for the Cultural Fair at school. Andy's grandmother has given him a scarab beetle in plastic, and Dolores dresses like an Egyptian queen. Andy isn't keen on working with bossy Dolores, and losing a t-ball game because Dolores is "dancing like an Egyptian" in the stands doesn't make him any more enthusiastic. 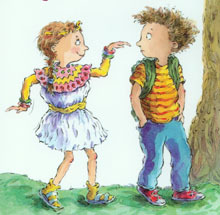 Jennifer Richard Jacobson's book is expressively read by Rachael Lillis, who provides a variety of voices for the characters. A musical background and sound effects enhance the telling. Page-turn signals are optional. The story deals realistically with children's feelings, relationships, and attitudes."